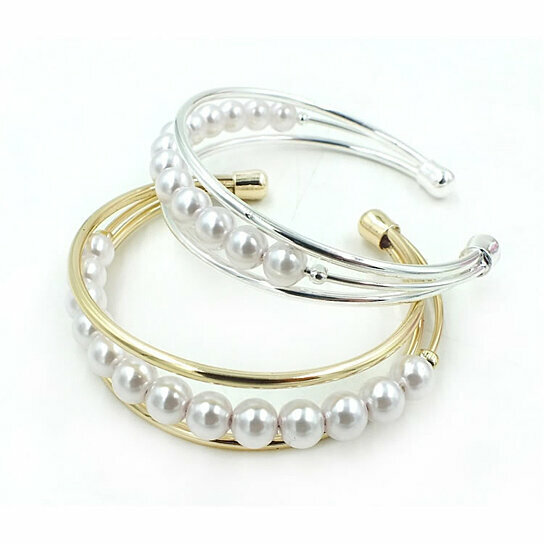 One rarely comes across such combination of pearls brought together on a silver and gold plated bracelets to create a rich piece of jewelry... It is so spectacular, that after wearing the Palace Pearl Bracelet you might just feel like waving your hands to greet your friends a' la pretty princess...! The Palace Pearls shows 13 Lustrous Faux Pearls of same sizes lined up on a triple bracelet made of Silver and Gold plating. Pearls are 8 mm round. Will fit Wrist size 7 inch to 8.5 inch and adjustable to fit your wrist. It comes in a Gift Box. Get more for yourself and for Mom, sister or a friend. Each sold separelty.